Our product range includes a wide range of co2 insufflator, electronic co2 insufflator, fiber optic cable for led light source and vessel sealing systems. We are counted amongst the foremost manufacturer, supplier, exporter trader, importer of CO2 Insufflator. The offered insufflator has real time display of bottle pressure of central gas supply pressure. This insufflator is designed using the modernize technology and finest grade material as per the standards of market. Also, our offered insufflator can be availed from us in a confine time at very reasonable price. 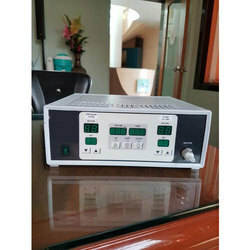 We are engaged in offering a comprehensive assortment of Electronic CO2 Insufflator that is used for the examination of the abdominal organs. Our offered electronic insufflator is designed using high grade material and leading technology in sync with the standards of market. 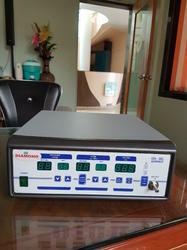 We also provide this electronic insufflator in numerous specifications as per the needs of our customers. We have gained a remarkable position in the industry by offering a qualitative assortment of Fiber Optic Cable. Our offered cable is designed using high grade material and leading technology in sync with the standards of market. 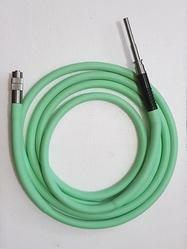 We also provide this cable in numerous specifications as per the needs of our customers. As well, this cable is used to transmit telephone signals, cable television signals and internet communication signals. Keeping track of the latest market developments, we are devotedly engaged in offering a wide assortment of Vessel Sealing Systems. Our products are developed from the high quality of material & leading techniques as per the norms of industry. These products are tested in terms of quality before supplying in the market. We provide entire range of products in numerous specifications as per need of customers. Reusable accessories 5 mm and 10 mm. Tripolar 5 mm force for vessel sealing with cutting knife facility. 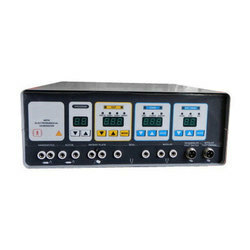 Measures impedance of tissue in instrument jaw and appropriately delivers power to seal tissue perfectly. Reduces cost of suture material and saves time of surgery. Incorporated independent bipolar system (white coagulation) less lateral spread. Three coagulation modes-spray, fulguration and desiccation. Argon beam coagulator upgradable. Patient plate disconnection alarm & indication Incorporated. Looking for Hospital Equipment ?